New mini brains grown in test tubes open up new research possibilities in neuroscience that could help cure brain diseases such as microencephaly. 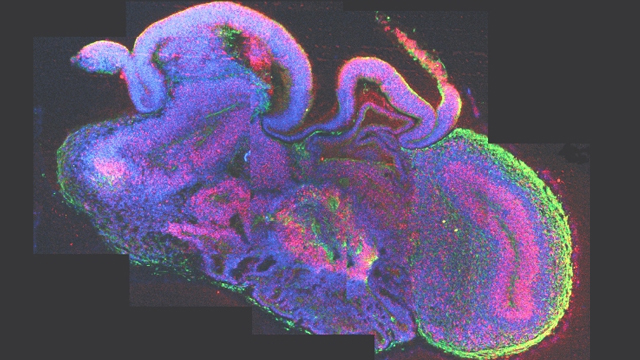 A team from the Institute of Molecular Biology of the Austrian Academy of Sciences (IMBA) used human pluripotent stem cells to grow 4mm cerebral organoids, or mini brains, in their laboratory. Using a new technique, the scientists provided an optimum environment for brain cell development and then let nature take its course. Similar methods have been used to successfully grow small sections of human intestine, retina and even the pituitary gland. The IMBA’s research shows that human brain cells have an innate ability to form complex brain tissue without any external cues. The mini brains developed a wide range of interconnected neural tissue including areas consistent with the dorsal cortex, choroid plexus, ventral forebrain and retina. They also developed a central fluid filled cavity similar to the cerebral ventricles that make up part of normal brain anatomy. Despite their diminutive size, these mini brains have already been used to make a big breakthrough in the understanding of microencephaly – a condition where the brain does not develop to its full size. The IMBA team used stem cells from a microencephaly patient to grow a mini brain genetically predisposed to microencephaly and found that not only was the mini brain smaller than the others but it showed premature neural differentiation. The work has uncovered a potential mechanism for the disease where early neural differentiation leads to smaller overall brain size. The scientists were also able to pin down the role of a specific protein in microencephaly development. The protein is usually absent in sufferers but was restored by inserting a missing gene into the stem cells. The result was that neuroepithelial tissue in the mini brains grew to a larger size thus confirming the protein’s importance to development of the disease. Professor Paul Matthews, head of the Division of Brain Sciences at Imperial College London, can see many potential uses for mini brains including study of neurodevelopment disorders such as autism, schizophrenia and some epilepsies. “It could also provide a novel approach to environmentally influenced development disorders, such as fetal alcohol syndrome or the effects of maternal hyperglycaemia.” He said. Another use would be in drug development where the effects of a new drug could be tested on developing brain tissue. Potentially, the technique could be up scaled to grow a living model of the blood brain barrier and test how well different drugs permeate the brain from the bloodstream.